Transducer in ultrasonic test is used to generate wave, sends sound pressure to a material and receives wave, which travels and/or returns by reflection. There is few reports that output waveform from a flaw detector is not the same that of the ultrasonic visualization system. The deformation was caused at the convert from sound pressure to electric voltage and characteristic of amplifier. In this paper simulation of voltage waveform converted from sound pressure which will be received by a transducer in ultrasonic tester are studied. We confirmed that the result of simulation is similar to the waveform actually received by the receiver. Oppositely, inverse calculation from received voltage form to find the mean waveform of pressure to be expected made a good agreement to waveform visualized. We can appear again the original waveform of sound pressure from received voltage waveform of flaw detector. It lead to a many applications and exact interpretation of phenomenon, for example, measurement of the slope of reflector and large reflection echo which appear at the shortest path and two small echo with negative phase at the path from reflector, when reflector is near the large transducer. We usually observe an output waveform on the monitor of ultrasonic tester. Ultrasonic sound pressure generated by a transducer is modulated by property of material and reflection, and then received by the transducer again. We can see ultrasonic wave generated in glass material by an ultrasonic visualization system. Output waveform from a flaw detector is not the same to pattern by ultrasonic visualization system. The deformation was mainly caused at the conversion from ultrasonic sound pressure to electric voltage. That is because of circuits around the transducer. We usually know the received waveform is varied by the operation of damping resistance of pulser and/or receiver. That is realized to have an electric destortion, as it will be varied by the operation of damping resistance. 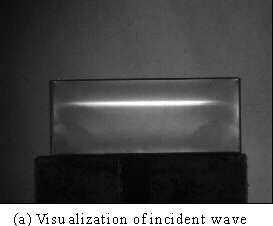 In the experiment, sound pressure is measured that can be seen by the visualization system, when ultrasonic wave is incident normally to glass model. Voltage waveform translated by transducer was simulated by differentiate the sound pressure waveform. On the other hand, traveling waves were received by transducer mounted on parallel boundary to propagating wave and monitored the two voltage waveform. One is actually received and the other from output of amplifier. Oppositely, inverse calculation was carried out to two-voltage form of actual and out put respectively. Another experiment was to the reflection from leaned boundary. Transducer was mounted on oblique surface with an angle to the traveling wave. Measurement and calculation was as well as carried out to sound pressure, actually and output voltage. Sound pressure is generated by a transducer by exiting the voltage. Sound travels into a medium with its velocities decided by density and elastic constants of material. Traveling sound is received by the same or another transducer again. And converted the pressure into voltage by piezo-electric effect of transducer. Receiving signal is sent to amplifying electrical circuit. Monitor of ultrasonic tester usually shows the amplified signal. If we excite a broad band transducer with step-shaped pulse, voltage of transducer crystal gradually increase with the time. Sound pressure generate as shown in Fig.1, as the sound pressure is the second derivatives of piezo-electric crystal thickness. When transducer receive the pressure, the voltage generate in pro- portion to the pressure by converse piezo-electric effect. However, output voltage is near to the derivatives of sound pressure, because the input impedance is set to about 50ohm in most of ultrasonic tester. Sound pressure distribution traveling on the specimen can be observed by the visualization system the same as the photo-elasticity. Voltage waveform converted from the sound pressure. We measured the voltage waveform reflected from the oblique boundary with an angle to the traveling sound pressure. Two pattern of voltage waveform are measured. One is from transducer contacted directly on the oblique boundary and the other from the output of amplifier. Consider the reflection wave from reflector shown in Fig.2 (a), (b). When transducer is placed to parallel to reflector, sound pressure on path 1,2,3 are equal each other because of the same path length. Resultant of sound pressure is single and RF echo is one cycle alterrnate on the ultrasonic tester. However, path length from leaned reflector in Fig.2 (b) is different on each path. Sound pressure is composed of long time range and low frequency. RF echo will be supposed to separate by two in this case differentiating the sound pressure. Rectangle glass model of 20mm thickness and two square transducers is prepared. Effective area of two transducers are 10 x40 mm² and 10 x16 mm² each. Its resonance frequency is 5MHz. Wave velocity is 5454 m/s (Longitudinal wave) and 3435 m/s (share wave). Long size transducer set to the bottom of the model and longitudinal wave is incident normally to the model. Traveling and reflecting wave at the top boundary are observed from visualization system. Fig.3 (a), (b) is an example of pattern and sound pressure distributions calculated from image file. On the other hand, the transducer set on the top boundary measures receiving voltage. Fig.7 (a) is the transducer voltage waveform directly connected on boundary. And Fig.8 (a) is RF output waveform after transducer voltage passed through the amplifier of the receiver. We mentioned above that voltage waveform of transducer is close to differentiation of the sound pressure. That will be experimentally proved by the top curve of unipolar waveform in Fig.4, which is a sound pressure in Fig.3. And the bottom curve is its graphic differentiation. You will see that the bottom curve is very similar to the curve in Fig.5 (a), which is received voltage waveform by directly connected transducer with oscilloscope. On the contrary, Integration of received voltage waveform will make its sound pressure. Fig.5 (b) show the graphic integration of Fig.5 (a). This curve is close to sound pressure of normal incidence in Fig.3 again . Similarly Fig.6 (b) shows the graphic integration for the output voltage(Fig.6(a)). We have pointed out before that direct receive voltage waveform is not to the RF output waveform after the signal passed through electric circuits. The result is confirmed by two calculations. Sound pressure is corresponding to actually received waveform by transducer, not to output one. The difference of sound pressure waveform in calculation is of unipolar for former and of 1.5 cycles for latter. 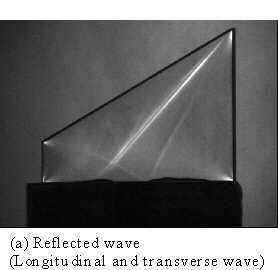 Experiment was carried out to trapezoid glass model. Measurement and calculation was as well as carried out. Reflected pattern at the oblique boundary with the angle 30degree to horizontal is shown in Fig.7 (a) in which there are share waves converted the mode by reflection and its graphic differentiation shown in Fig.7 (b). Actually voltage and its inverse calculation for sound pressure is shown in Fig.8 and output voltage and its calculation shown in Fig.9 respectively. Though the results are not so simple as that of plane boundary, two or more waveform with long time range and low frequencies are observed in comparison with the simple one. When transducer receives sound pressure, voltage is generated in proportion to it. That will be right if the value of damping resistance is enough. If not output voltage will be affected . We can see the difference of impedance between 100orhm and 1Mohrm as shown in Fiig.10 and 11. Received voltage on the boundary with the angle 15degree is shown as a explanatory notes original. Another line shows delivertives of received waveform in Fig.10 at 1Mohm and in Fig.11 shows integration at 100ohm. These two very similar each other.